The Bible says in Heb. 3:13 we are to “encourage one another daily.” Yes it says daily! We need daily encouragement, daily good news, daily energy to keep on in the faith and face the challenges of the day. Encouragement is a by-product of the local church. If you’re looking for encouragement but can’t seem to find it, try our church, Crossfire, in Centennial, Colorado. We believe in building people and encouragement is a building block of our church. We have a prophetic edge, vibrant worship, challenging teaching, and freedom to walk according to the leading of the Holy Spirit. Come and visit us this weekend. We will be excited to see you! You will be encouraged! 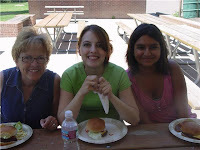 Pictured: Pastor Deborah, Katie N., and Hope R. at the annual all-church picnic.